I know, it seems a little early (at least to me) to be starting gift guides. In blogland, I am behind the times, but I just can’t any sooner than now. And honestly, I don’t really get into Christmas mode until Thanksgiving is all said and done. Once that is over and Black Friday rolls around, then I can start thinking about Christmas. But, you give the people what they want, right? And if what they want is a gift guide then that is what they shall get! If all goes according to plan, I will have a gift guide for: him, her, and then maybe ones for your Secret Santa, Pollyanna type gift exchanges. You know, the ones where you only need to spend like $10 but you just don’t know what to get? I will give it my best shot! So first up today is the Gift Guide Under $50! This was a labor of love/hate (moreso hate…I can’t stand all of the coding/html stuff!)! Enjoy! 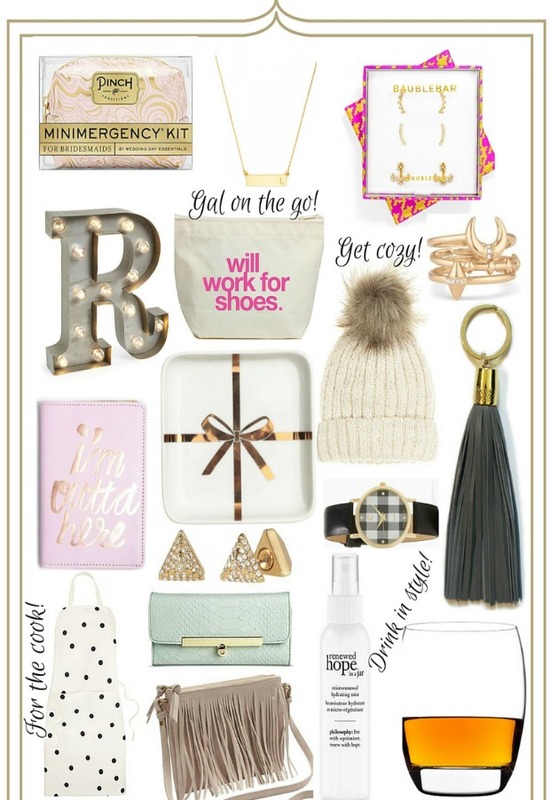 Minimergency Kit by Pinch Provisions: I think I have this in one of my gift guides every year. But really, you can’t go wrong with it. I bought one for Ella’s teacher last year (they make a special teacher’s one), I have one. They are great! Filled with anything and everything you might need in an emergency- a needle and thread, breath spray, a bandaid, deodorant, the list goes on. There are a ton of colors to choose from, and they also make special ones for brides, bridesmaids, college students and there’s even one for him! They make one especially for little girls– I got one for Ella’s stocking last year! BaubleBar Initial Bar Pendant: Not only is this the perfect, personalized necklace, but it is great for layering, too! Layering delicate necklaces what seems to be popular, so a simple necklace like this is keeping you on trend without being ‘trendy’ if that makes sense? Trend aside, it is something that can be worn for years to come! BaubleBar Ear It Is Gift Set: I would be one happy camper if I got this as a gift! It comes with three sets of earrings- two ear crawlers and one set of jackets. They can be mixed and matched so you are getting a ton of new earrings for such a low price! It’s prepackaged in a custom BaubleBar gift box so it is ready to be gifted! LED Letter Light: Love this idea! This would be a perfect gift if you are heading to someone’s holiday party and you want to bring a gift (instead of a bottle of wine)! Obviously easy to personalize and a great addition to anyone’s home (or office) decor! Dogeared Will Work for Shoes Lil’ Zip: I have this, and love it! It is super roomy and is perfect to store any little incidentals when you are traveling, or if you are just on the go a lot. They have other cute sayings like ‘chocolate understands’ and ‘stay golden.’ As if they couldn’t get any cuter, they are Made in the USA products! Stella and Dot Aurora Ring Set: This super cute ring set is adjustable, so no worries about ring sizes or anything. They can be worn together or separately, based on your own personal style! Love them! H&M Small Porcelain Plate: Just like the LED letter, this would be a great little gift to give a hostess. Show up to a party with cookies on this plate, but make sure to let them know the plate is theirs to keep! When the holiday parties finally come to a stop, this would be cute to display on a dresser or night stand to hold things like jewelry or even keys. H&M Wool Blend Hat: Who wouldn’t love a hat like this? Cute, stylish, simple, but a necessity! It’s only $12.99, so you really can’t go wrong! Blair Ritchey Tassel Keyring: I will take one in every color, please! I have several, but I still want more! These are handmade in the USA (yes, each tassel is handcut) so you know a lot of care went into each one. They obviously make your keys look stylish, and make them easier to find (at least for me)! You can also get a tassel (without the keyring) to snap on to your bags…it gives it just a little something extra! Kate Spade Le Pavillion Apron: I have a thing about aprons. I don’t wear them, but I want to. And I want one in every color, pattern, style, print, all of the above. What I love about this apron besides the polka dots is the fact that if you flip up the bottom of the apron (while you are wearing it), it has a measuring guide. How awesome is that! Stella and Dot Deja Vu Double Sided Gold Studs: Can’t go wrong with earrings. They are basically a one size fits all, so you don’t have to worry about sizing! And something like these earrings doesn’t really go out of style so they can be worn for the long haul! They are double sided which means they can be worn two ways! Target Snakeskin Wallet in Mint: I have a thing for wallets. If I could, I would change them as often as I change my jewelry or my outfits! But, I usually never buy myself a new wallet, because I would rather spend the money on something like a new purse, or a shirt-something people will see all the time! So for me, a wallet would be a great gift-something I want but never buy for myself! The price is right, and there are a lot of credit card compartments, too! Old Navy Fringe Crossbody Bag: Love this! Super cute for a woman of any age. Big enough for essentials, small enough to not get in the way! Renewed Hope in a Jar Hydrating Mist: This mist refreshes, re-energizes and rehydrates your skin. I am new to the whole “misting your face” thing, but my cousin Bets swears by it and loves it! I can imagine misting yourself in the face would give you a nice little pick me up during the day! Charming Charlie Buffalo Check Watch: Isn’t this just the most darling watch ever? Cute, but still classic enough to wear every day. And just like earrings, you don’t have to worry about sizing so this makes an easy gift (unless they have like freakishly small or large wrists?!). It comes in blue, too! Crescendo Whiskey Tumbler (set of 4): This would also be a great gift for a host/hostess. Show up with these and a bottle of good liquor and you will be set! A gift like this is something that will be able to be used time and again, so you know it will be a well received gift! Any questions at all, just let me know! If there is anything you’d like to see, gift guide related just let me know!